Optional MGT-4 four button footswitch available here! Built on the foundations of its predecessors the Fender Mustang GT40 Guitar Amplifier brings you massive fender tone in a cabinet that is ideal for your home and for the musician on the move. Packing in bluetooth and WiFi technology, masses of guitar amp models and effects, this is one little amp with a huge heart. At its core, the GT40 packs in a 40 watt amplifier that can also run as a 2 x 20 stereo amplifier when required. To work with this Fender chose a 2 x 6.5 inch speaker configuration. This means you can run the amp in straight mono or in stereo mode should you connect another audio device for amplification. All of the amplifiers parameters can be easily controlled via the very easy to use top panel that has everything you need clearly laid out. The GT40's amplifier and speakers are all housed in a very smart black cabinet with matching black grille cloth so that the unit will look neat in your home, on your desk or anywhere else you choose to set it up. 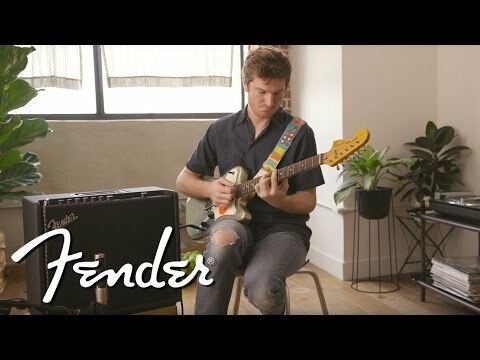 The Fender GT40 not only comes with a standard 3.5mm aux input for playing external audio sources but it also has built in Bluetooth to connect your smart device wirelessly for audio streaming. Another great feature of the GT40 is built in WiFi connectivity, something never before seen on an amplifier of this size. This means you can use the GT40 with the superb Fender Tone app. Not only can you control the amp in real time with one finger, just like the originals, you can easily upgrade the amp’s capabilities, adding more power and presets without patching a single cable. The GT40 sits in the "Goldilocks Zone" of being the perfect amplifier for a beginner but also as a great practice and recording amp for advanced players that will appreciate the beauty of the powerful effects and models that reside within. The Fender Mustang GT40 Guitar Amplifier is nothing short of a wonder-amp and is guaranteed to help you practice, perform and record to the best of your abilities. The Mustang GT 2.0 firmware update brings you even more amplifiers models, more cabinet models, new effects, and a range of new features and improvements to ensure that your Fender Mustang GT amp performs better than ever.